Upper arm pain refers to pain that is felt anywhere from just below the shoulder joint to just above the elbow. 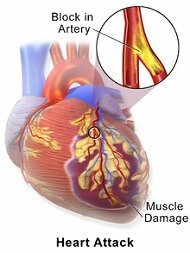 It may be a problem in the muscles, tendons or bones, or even referred pain from elsewhere such as the neck or heart. It may be a sign of wear and tear, postural problems or an injury. Here we will look at the most common causes of upper arm pain and how they present, how to tell the difference between them and how to know if it is something serious. We will then go on to look at the best treatment options. Pressure on the nerves that run from the neck across the shoulder and down the arm can cause pain in the upper arm. The nerve may get pinched where it exits the spine or anywhere along its path which leads to pain. 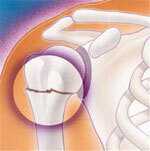 Nerve pain is often accompanied by pins and needles and/or numbness in the arm or burning shoulder pain. 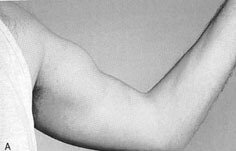 You can find out more about the causes of upper arm pain by clicking on the link above. 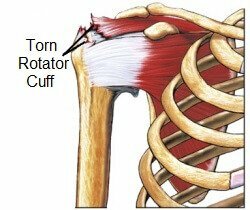 If the pain is more across the front of the shoulder and chest, it may indicate a problem with your collarbone - visit the collar bone pain section for help working out what is going on. 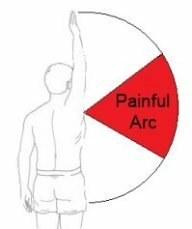 If it's radiating to the shoulder blades or across your upper back, visit the shoulder blade pain section. Most cases of upper arm pain benefit from strengthening and stretching exercises - visit the shoulder exercises section for a whole range of exercises that might help. 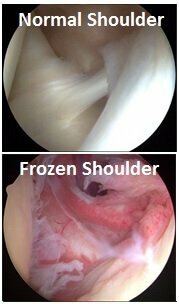 If none of these is sounding quite like your pain, it may be that there is something else going on such as bursitis or a problem in the shoulder joint itself.